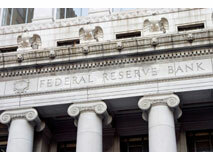 The Federal Reserves decided Wednesday to cut federal funds target rate 50 basis points to 1%, and discount rate by half a point to 1.25%. The Federal Open Market Committee said its recent action should improve credit conditions. But, it warned that “downside risks to growth remain.” Vote to cut rate was unanimous. Pimco’s Bill Gross, appearing on CNBC, said the 50 bps cut was expected and that the language in the statement suggests further cuts or that the rate will stay at 1% for an extended period of time. The Fed’s cut is certainly good news for borrowers, but bad for savers – since returns from conservative investments will continue to fall. This is the ninth time that the Fed has lowered rates since Sept. ’07. When will the Fed and the rest of the central banks run out of bullets? ?